Gross Area: 189,500 sq. ft.
Area Per Student: 195 sq. ft.
During the planning process, the design team worked with a stakeholders group to articulate the community’s desire for a variety of learning and social spaces in which students can experience science, technology, and arts education outside of the traditional classroom. 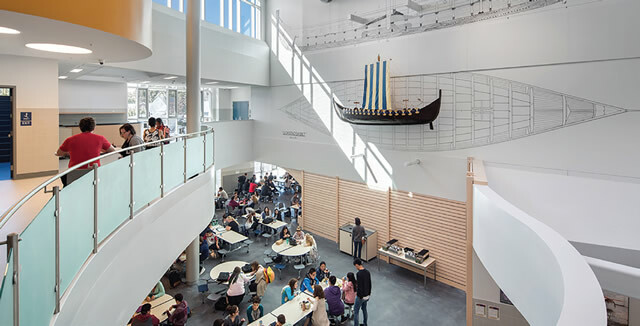 While the school already had successful programs, including a “Viking Longships” class in which students explore Viking history through project-based learning, the existing physical facilities did not adequately support such programs. Having community access to spaces that supported Winthrop’s performing and visual arts was also critical to the project’s success. The design of the new Winthrop Middle/High School expresses these goals and is a showcase for student achievement and community pride. It is completely outfitted for 21st century, hands-on learning to complement the STEAM-centered curriculum of the middle school and the cross-curricular team-teaching at the high school level. A range of spaces are used by students and the greater community both during school hours and for evening and weekend events. A feasibility study assessed various options for upgrading and improving the school district’s grade 6-12 facilities, from which the town concluded that simply renovating their high school would be an expensive proposition with little benefit to student learning, and that the site of the town’s aging middle school was ill-suited to meet future needs. Due to the lack of alternative buildable sites, the most sensible option was to consolidate the two schools into one new facility on the only site available - the site of the old high school. By combining two schools under one roof with shared core facilities, the town avoided the costs of building, operating and maintaining duplicate core facilities. But there was concern that the two-school solution would be too large, too difficult to navigate, and not foster a sense of community in which students would feel known, supported and thrive. 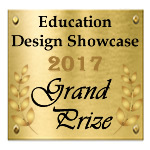 Therefore, a key design challenge was make the new building manageable in size and with the intimacy and separate identities of two smaller schools, all while still providing spaces tailored to each school’s disparate needs. To accomplish this, each school is configured in an L shape within the building’s rectangular footprint, and together the two L-shaped academic wings create distinct zones for the middle school and high school. 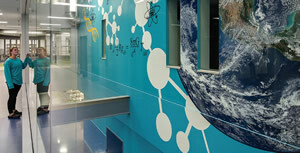 Each “school within a school” has its own entrance, administration, cafeteria, science labs and classrooms. 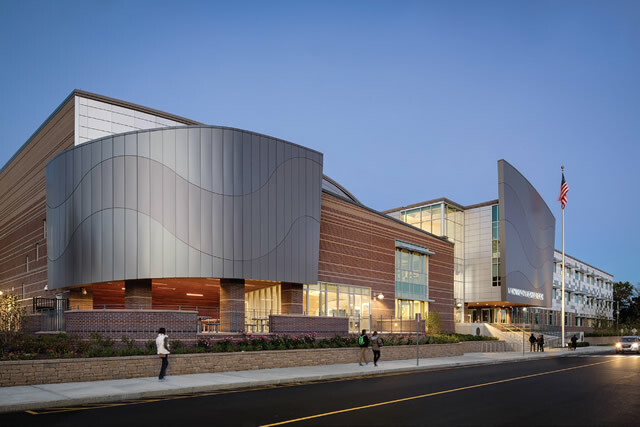 At each entrance, sculptural metal panels pop out of the otherwise rectilinear building envelope to mark the entrance itself and highlight special programs that are important to Winthrop such as fine and performing arts spaces. Each entry leads immediately to a large, welcoming, and dynamically sculpted space where students socialize informally at the start and close of each day. In both schools, this space doubles as a cafeteria and is adjacent to the administrative offices so school staff can easily monitor students in these areas. The Middle and High Schools are further differentiated by finish materials, colors, patterns and graphics, making them easy to navigate, even for students unfamiliar with the building. With clarity, transparency, abundant glazing, carefully planned adjacencies and unobstructed site lines, the large building’s layout and organization become intuitively clear. Classrooms in both wings are supplemented with learning commons, flexible work areas just outside the classroom doors where students and teachers can mingle and work individually or collaboratively in small groups. As an extension of the classroom, these learning commons serve as pull-out space for individual support, interdepartmental planning or small group collaboration, and reinforce the ambiance of a small learning community. 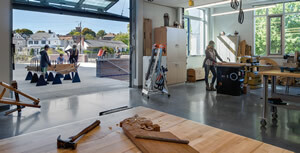 Within the high school wing specialized areas include a fabrication lab that hosts Winthrop’s “Viking Longships” program, where students explore Viking history through hands-on projects. A large bi-fold garage door opens from the fab lab space onto an outdoor classroom space, providing additional flexibility for large or messy projects. The fab lab is also used for set design when productions are held in the adjacent auditorium. By providing a variety of spaces where students and teachers can meet, work, and socialize, the school promotes the idea that learning can occur in many different modalities and contexts throughout the entire building, not just within the confines of the classroom. Sited in a dense, residential neighborhood, the school is a vital and intensely used resource for the community. Shared core facilities such as the gym, library, auditorium and black box theater are surrounded by the two L-shaped academic wings, but are fully accessible to the community after-hours, when the academic zones can be locked off. The project areas and learning commons are centrally located so that teachers and administrators can maintain oversight in an unobtrusive manner that allows students a sense of independence. Each school entrance is adjacent to the administrative office suite so that school staff can monitor people entering and leaving the building for security purposes. At the mid-point of design, the team was faced with a serious challenge when FEMA issued a new flood plain map that placed the school’s 8.2 acre site within the 100-year flood zone. Because of the implications for both constructability and sustainability, the design team developed a solution that would raise the building by three feet. The old high school’s concrete frame was ground up and reused as structural fill to build a raised platform under which large storage tanks are located for storm water retention. This resilient design solution not only solved critical flood plain and ground water issues but also helped to achieve a LEED exemplary credit by keeping 100 percent of the construction waste out of the waste stream. Because of its oceanside setting, the building envelope is composed of durable materials and rust resistant panels in patterns that seem to undulate like the waves and boat sails on the town’s shoreline and local beaches. In these ways, the building is designed both to endure the ravages of the coastal climate and to reflect the town’s maritime setting. Throughout the building, the extensive use of efficient LED fixtures, natural daylighting, and automatic daylight dimming systems in the teaching spaces conserves energy. Optimal floor-to-ceiling heights also accommodate an innovative ventilation and dehumidification system that reduces the need for air conditioning by utilizing a passive chilled beam displacement system. In the center of each learning commons a lightwell funnels natural daylight deep into each level of the building and contains the large air ducts, making visible the systems that contribute to a comfortable and healthy learning environment. To fit two schools on the existing high school’s small site, the new building was designed to be a very dense, mostly three-story box, which posed a complicated challenge of getting daylight into all the interior spaces. The design solution creates lightwells through the project areas to bring daylight down to all three levels. The lightwells are cylindrical cones that taper from top to bottom to maximize light distribution. Flexible furnishings in the project areas at each level of the lightwells allow for a range of uses including storage and display of projects, small group collaboration and quiet, individual study. Supergraphics are another unique feature that helps with wayfinding and expresses the school’s dedication to learning and community. The Viking Longship class at Winthrop High School is project-based learning at its best. In this class, the students learn about Viking history and create different types of related projects such as Viking recipes, clothing, and construction. The first student-built longship is a half-size replica from the Viking Ship Museum in Oslo, that was on display in the lobby of the old high school but in very poor condition. While the students worked diligently to refurbish the ship during the construction period, HMFH identified a prominent location in the new high school cafeteria and the architects and students worked together to design the refurbished Viking Longship’s unique display mounting. The project was delivered on time and on budget. Diligent cost management paired with an integrated design process and well-coordinated design documents resulted in the return of over $2.8-million in savings at the end of the project. Nice integration of the middle and high school. Good use of super graphics. Connection of learning space to the outdoor space is also a nice feature.